Over the past 10 years a group of church planting leaders from diverse European nations have been meeting regularly to think through National Church Planting Processes (NC2P) in Europe. Click on the link to know more about this exciting movement of which I have been privileged to be part of the leadership team of for the past 5 years. Can you identify the 4 basic parts of NC2P? This week is full of strategic face-to-face meetings in Berlin with leaders from some 30 European countries as well as a few observers from other continents. Because we feel that these meetings are so strategic I am asking you to consider setting aside a few moments each day to pray for us this week. - Pray for an initial meeting of M4 leaders and Multiplication network leaders over breakfast. I will be facilitating this meeting. - Pray for the strategic meeting of 40 European/International influencers discussing the role of the "apostolic" leader in promoting church planting movements. -The 2 day Learning Community starts with around 170 people from 30 nations. I will be presenting the Story of the Spain National Process. Click here to see a video. Twelve countries already have similar movements, 13 others are in the process and the rest are just getting started. -Pray that each delegation will get a clear vision from the Lord of what His next steps are for them in their respective nations. Most of the delegates will be heading home but a remnant of 25 will take an additional day to meet with observers from non-European continents to talk about the next steps needed to promote similar national church planting movements around the world. Participants will include strategic leaders from the Lausanne Movement, (Me!) WEA, GCPN and GACX. All of these groups are "global players" in the area of church planting. We have been in contact via skype for several months but this will be our first face to face meeting. Our goal is to see a National Church Planting Process in every country of the world. 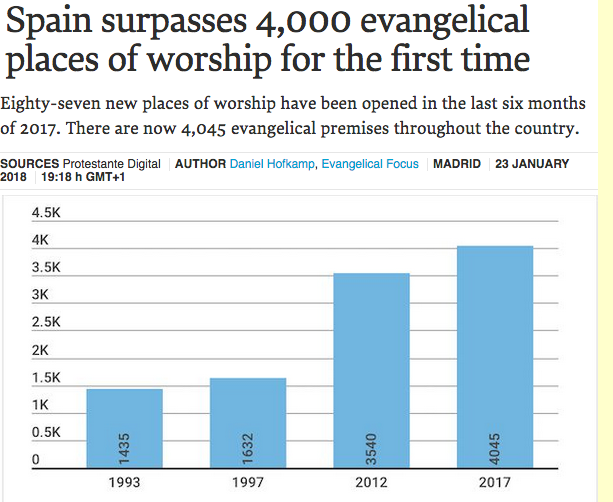 Travel back to Spain and join the group of 50 church planters who will be meeting in Madrid in the first learning Community of the second cycle of the M4 training process. I will be giving a talk on "The Power of Vision in the church plant." Pray for Brenda as well as she stays in Spain. She will be giving the study to the ladies meeting in prison this Monday and then go to Castellon to visit Rachel, BJ, Miriam and Laura for the rest of the week.